If you have been following along these past couple posts, you probably have some questions about choosing which cover crops to plant and where they should go. In order to know what to plant in a certain spot now, you need to know what is planned to go there after that. I hope you’ve made a map of your garden showing all your beds, drawing it to scale on graph paper first, then making copies to play with. Now is the best time to be planning your garden for 2012. If you know what your main season crop will be, you can better plan the preceding cover crop, which you will be planting soon. Common choices for fall planting in my area in zone 7 are cereal rye (often referred to as winter rye), winter wheat, crimson clover, hairy vetch, Austrian winter peas, radish (oilseed, forage, or daikon), and oats. You can find information about all these crops and more by reading Managing Cover Crops Profitably, 3rd edition, published by SARE. I don’t sell this book from my website, but I do have copies for sale when I have a booth at events. I like having a book-in-hand, however this one is available FREE online at http://www.sare.org/ so you have no excuse for not using it. Check your seed catalogs for their selections of cover crop seeds and read the descriptions carefully to see if they will do well in your area. In the mid-Atlantic region we have Southern Exposure Seed Exchange to look to. Become acquainted with the seed companies in your region. Ask about cover crop choices locally, maybe from the farmers at the farmers markets, and check with the Cooperative Extension Service in your area. Their publications are online so you should be able to find appropriate information for your state. I know I have some readers out there from beyond the U.S. Welcome! I’m thrilled to have you along on this journey. It would be great if any of you, no matter where you are, would add a comment to this blog telling us where you live and what cover crops you find helpful. Gather all the information about the cover crop choices for your area and put it in a section of the garden notebook that you would have made if you’ve been studying my garden plan video. That will be an easy reference to go back to. Now, for choosing which goes where. Cereal rye is my favorite cover crop because of all the biomass it produces both above and below the ground, but it’s not appropriate for everywhere. If you want to get an early start next year with sugar snap peas, onion sets, and lettuce planted in early March, you are going to want that bed to be ready to plant then and not have a thick crop of rye growing there. If you are in an area where oats will winterkill, like I am, you could plant that in late August or early September. Another good choice is radish–oilseed, forage, or Daikon. You would want to plant that in late August or early September, also. These two crops need to grow a lot of biomass in the fall. They will succumb to the weather in January in my area. In the case of the radish, you want the plants to have the opportunity to grow large radishes that will poke good-sized holes in your clay. When it winterkills, the radishes compost in place and give back to the soil, leaving holes for air and water to come in. The leaves dissolve on top and the bed is soft and ready for your next crop. If you wait too long, Mother Nature will plant her own crop of weeds, so use these winterkilled crops where you are planting something early the next year. 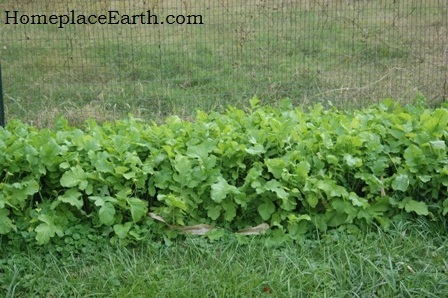 By the way, you can harvest the radishes for the table or fermenting crock until about New Years in my area in Zone 7. I mentioned clay soil, but cover crops are equally good for building up sandy soil. No matter what you have, clay or sand, adding organic matter is the solution to soil building. My last frost date here is about April 25, so keep that in mind and adjust accordingly when figuring your times to plant. If you want to have the bed ready for your main season crop about April 1, three or four weeks before the last frost, that rye is still not going to be at a good place for you to work. Those beds are where you might want to have hairy vetch, Austrian winter peas or crimson clover growing. These crops can be taken as biomass for the compost pile at any point in April and into May. If they are flowering, you can likely cut the plant and leave the roots in place. If they aren’t flowering yet, pull them out, roots and all, for the compost. That will insure they won’t grow back. The soil will be nice and friable and ready for the next crop. These crops are legumes, plants that pull nitrogen from the air and accumulate it in the nodules on their roots. They make a short-lived mulch if you should try to just put it back on the bed, so better to add it to your compost. Better yet, make sure you are also adding some carbon to the compost at the same time, such as stalks or straw saved from other crops. 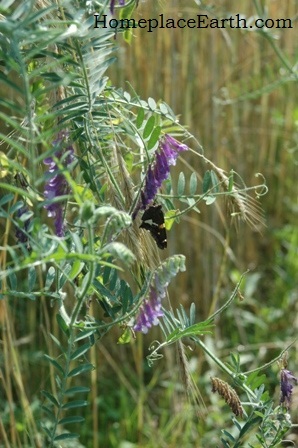 Some people like to plant hairy vetch in a bed where they will have tomatoes go in the following year. I often plant Austrian winter peas that will be followed by potatoes. Now, about that rye. Any plant is going to be at its most biomass when it’s flowering. After that point its energy begins to go toward making seeds. At my place the cereal rye is flowering (shedding pollen) around May 7. In the beds I am going to plant soon, I’ll cut the rye then, leaving it lie right there for two weeks to settle, then transplant into it. Keep in mind I said transplant. The roots are decomposing enough to transplant, but the bed is still too rough for sowing seeds, unlike the conditions left after the legumes or those winter killed crops I just told you about. Suggestions for crops transplanted into these pre-mulched beds are corn, tomatoes, peppers, and winter and summer squash. If you want to grow the cereal rye or wheat out to seed, the harvest is not until mid-June. At that point the plant has fulfilled its duty producing seed and is on its way out. I cut the plants with a sickle near the ground and my harvest is seed (to eat or to plant) and straw for the compost pile. The roots decompose rapidly and you can make a furrow with a hoe right in the stubble and plant the next crop immediately. This is the time to plant the hot weather crops–those that enjoy soil temperatures of about 65 degrees, such as cowpeas. It is also a good time to put in a second or third planting of zucchini, cucumbers, or snap beans. Or maybe you’ve designated this bed for carrots and beets. I usually broadcast wheat and rye when I plant in the fall, but if I’m going to follow it with carrots and beets, I’ll plant it in rows close together. When the grain is cut, the stubble is in rows and I can easily make a furrow with a hoe between the rows and put in the seeds for the root crops. The stubble gives a little protective shade to get started. Your timing and crop choices are likely to be different than mine, but this should give you some idea how it all works. As you work with your choices on your garden map, keep in mind rotations and put the arrows on your map showing the direction everything rotates. It all becomes sort of a juggling act. In order to get oats or radish in by early September, the previous crop needs to be finished by then. A bed where tomatoes or peppers are in there until frost is not a good choice. In my video, Develop a Sustainable Vegetable Garden Plan , I take you through a four bed plan, explaining the rotations and crop choices, including cover crops. The beds are full all twelve months. The companion CD, which has all the planning worksheets, also has a seven bed garden map that is based on the garden I show in the video. That map is for you to study to give you another example. Originally I wanted to use that one in the video, but it would have taken too much time to explain it, so we gave it to you on the CD. 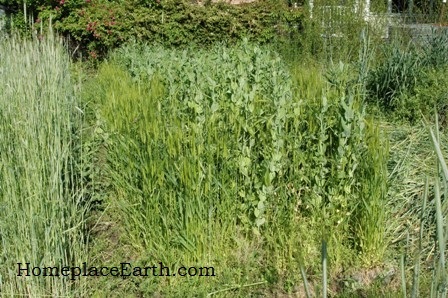 In my video, Cover Crops and Compost Crops IN Your Garden , you see my garden from March through November as I explain how to work with these crops. The management techniques that I propose use only hand tools. The crops are carefully planned so that the harvest of one crop prepares the way for the next. People who use tillers do not have to plan quite so closely. They just churn everything up and go on to the next crop. That harms the soil structure, creates hardpan, and lets loose more nitrogen than the soil can handle at one time, losing nutrients. If you are late getting the cover crops in, cereal rye and Austrian winter peas are your best choices for a late planting. My first expected fall frost date here is in mid-October. I prefer to have everything in by the end of October, but I’ve planted these crops as late as mid-November, when necessary. It takes some practice learning which crops to plant and how to follow the growing rhythms . Once you learn the dance, you will see great changes happening in your soil. Now that you are all aware of the dangers of bringing outside inputs into your garden from my last post, you are probably wondering just how you go about growing enough cover crops to make all your own compost to feed back the soil. Cover crops are crops grown specifically to feed the soil, although some also produce food for people in the process. According to GROW BIOINTENSIVE (GB) methods, you would have to plan to have these crops in 60% of the garden for the year. Keep in mind, however, that I’m talking about the whole year. Many people only grow things in their garden from spring till fall and at the end of the growing season they just leave things as they are until the spring clean-up. I’m talking about keeping your soil active and having something in there for all twelve months. For those of you who want a biblical fallow year every seventh, that is easily arranged with this system. To plan for this 60%, you would first need to know the area of your actual planting space. If it is divided into growing beds of equal size then you already know how many beds you have. Each bed has twelve Bed Crop Months (BCM)–twelve months that a crop could be grown there. If the space in your garden is divided into planting areas of different sizes, you would need to work through this exercise using the number of square feet being planted, rather than the number of beds. The cover crops you would be growing might include cereal rye, wheat, clovers of any kind, winter peas, spring field peas, buckwheat, sunflowers, and Jerusalem artichokes. 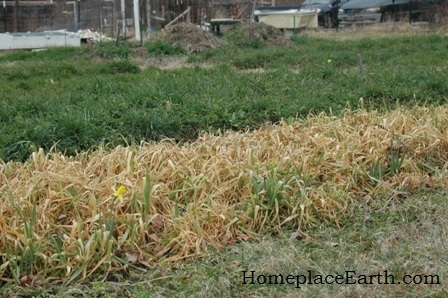 Some of these crops might be cut early to lay down as mulch and information about that is in my videos and my post on 5/17/11. Some crops such as rye and wheat are grown for their straw for compost and food for the table. Corn, sunflowers, and Jerusalem artichokes also provide much needed carbon for the compost pile with their stalks. The clovers and peas would provide nitrogen for the compost with their biomass. In GB terms, they are the immature crops and the straw and stalk producing crops are the mature crops. I have a worksheet that will help you figure how to get that 60% of soil building crops. You can access the worksheet at BCM worksheet and it is available on the resource page of my website. For those of you with dial-up internet, it is a form with four columns labeled: Bed #, Crops, 60% Crop BCM, and 40% Crop BCM. To help you with this project, you should have a garden map with every bed filled in with what’s growing there for the entire year and the dates those crops occupy each space. Make sure each bed is labeled with a number. Determine the total Bed Crops Months (BCM) for your garden by multiplying the number of beds times twelve. 60% of that number would be the target for cover crop/compost crop BCM. Compost crops are cover crops grown specifically for the compost pile, but I’ll just refer to all these crops as cover crops. Now, referring to your garden map, list all your crops on the worksheet beginning with everything that is in Bed #1, then Bed #2, etc. If it is a cover crop, including those grown for food such as small grains and corn, work out the equation (# of beds X # of months in the bed = BCM) in the 60% BCM column. If the crop is not a soil building one, work the equation (# of beds X # of months in the bed = BCM) in the 40% column. Total up the BCM in each the 60% column and the 40% column. If the whole bed is planted in the same thing, the # of beds in the equation would be one, of course. However, you might have several crops growing in the bed at the same time. In that case, the # would be the portion of the bed in that crop. If you presently do not have your garden filled all twelve months of the year, it should be interesting to figure everything just the way you have it planted now. Divide each total by the total BCM for your garden to find the percentage of each. If your garden is not full for the year, combining the totals for the 60% and the 40% crops won’t add up to 100%. The percentage that it would take to reach 100 is your opportunity to fill it with cover crops. Then, with some adjusting with your present crops, you will probably discover that it’s not as hard as you thought to reach 60%. Remember, if your garden beds are different sizes, instead of BCM you would be working out your calculations using square feet rather than beds. These crops are going to be feeding back the soil by their roots being left to decompose, by composting in place, and by being made into compost to be put back onto the beds. If you are short on cover crop BCM you might plant red clover (different from crimson clover) or alfalfa and have it grow in an area for two years, taking cuttings both years for compost material. 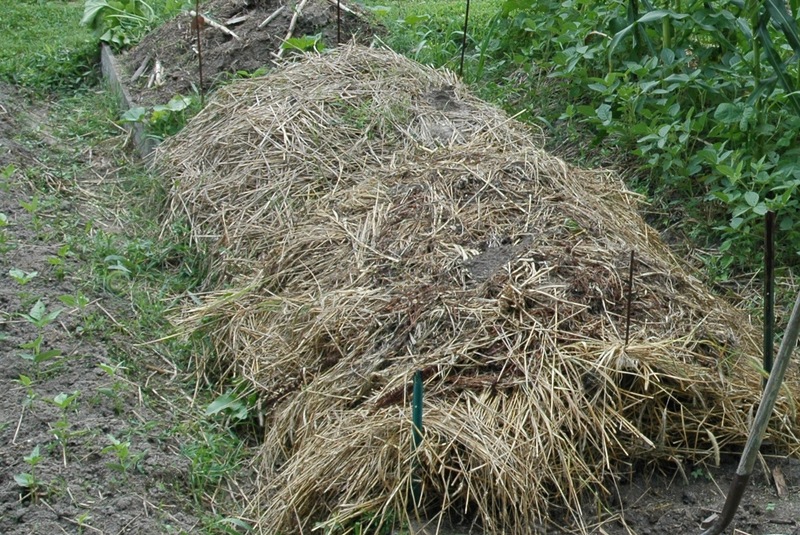 If you really insist that fallow means nothing is cut, you could designate a bed in your rotation to hold your compost. It’s not technically part of your 60%, but it wouldn”t be growing anything else and it would accumulate nutrients by whatever leaches from the compost. The next year the compost rotates to the next bed. An example of all this is a bed which has tomatoes in it from May through mid-October. The tomatoes, a 40% crop, would have 5.5 BCM, which is 45.8% of the 12 BCM for the year. If the other 6.5 months are filled with cover crops, that would be 54.2%, a little short of the target of 60%. That means that other beds in the garden need to make up for that. However, if you had corn in your rotation, with a cover crop before and after, the corn being a mature carbon crop for the compost, you would have 60% crops for all twelve BCM. My video Cover Crops and Compost Crops IN Your Garden shows you how to cut corn with a machete for the compost pile. If your garden consisted of only those two beds, it would have 24 BCM (2 beds x 12 BCM) with 77% of the garden in 60% crops for the year, leaving you with some leeway for a third bed. For some of you, this is all way too much information at this point in your gardening journey. If so, that’s okay. At one time, it would have been overwhelming to me, too. Just know that the information is here when you need it. For those of you who have been waiting for just this kind of information, you may be interested in reading the GROW BIOINTENSIVE material published by Ecology Action. Booklet #32 GROW BIOINTENSIVE Composting and Growing Compost Materials, Booklet #31 Designing a GROW BIOINTENSIVE Sustainable Mini-farm, and Booklet #33 Grow Your Own Grains; Raising, Harvesting and Uses are all available through Bountiful Gardens. Growing cover crops on this scale will do wonderful things for your soil, not to mention the terrific compost you can make, right IN your garden. Make your garden map and work through the worksheet. You will now know what possibilities await you for your garden planning. 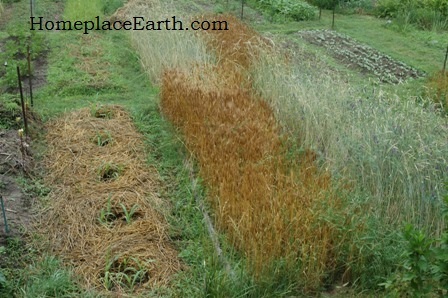 In my next post on 8/23/11, I’ll help you choose which cover crops to plant where. For now, as your crops begin to fade, or suddenly die as zucchini is prone to do, harvest them as compost material and toss some buckwheat in their place to keep the weeds away. 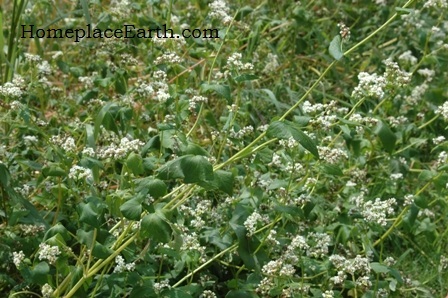 It will do good things for your soil and provide important nectar for the bees with its flowers in about 30 days. That will give you time to decide exactly which cover crop will go there for the winter. In the hustle and bustle of your summer, remember to take time to smell the flowers and to sit and listen to the sounds of nature around you. We can learn much from quieting ourselves and observing the gifts that are right in front of us every day.